Leo Diamond presents a 1/2ct diamond in a classic solitaire design with additional diamonds set into the shoulders for a beautiful line of light when viewed from above. The Leo Diamond is a product of four generations of expertise in the art of diamond cutting, resulting in the first diamond that was independently certified to be visibly brighter than other diamonds with 8 additional facets compared to traditional round brilliant cut diamonds. The band is made from 18ct white gold, with an authentic Leo inscription that features a smaller diamond set inside. An extra certificate is included in your purchase to verify its superior light performance. 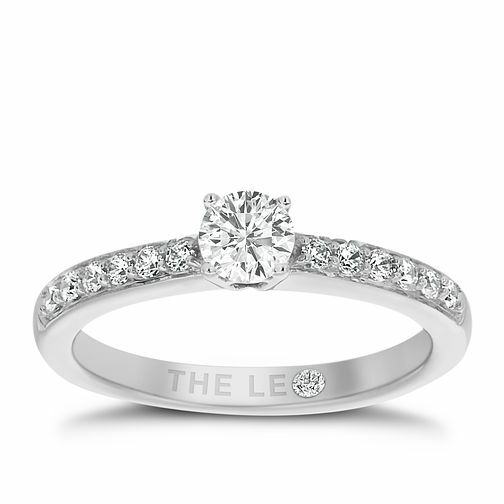 Leo Diamond 18ct white gold 1/2ct diamond ring is rated 5.0 out of 5 by 5. Rated 5 out of 5 by Anonymous from Perfect ring, perfect sparkle I got engaged September 2017 in front of Cinderella castle in disneyworld Florida! It was so magical and even more beautiful with the engament ring me and my partner picked back in January 2017, I could not wait to show off my ring to everyone, and still can’t now, everyone comments on how sparkly the ring is, so if any of you are wanting a beautiful ring to look at every single day with the high sparkle, then go for this .. I can’t wait to get the matching sparkly wedding band to match!